5 makuuhuonetta, vuodepaikkoja 10, 3 kylpyhuonetta, erillinen uima-allasalue, idyllinen maaseutu. Villa San Filippello sijaitsee vain 2 minuutin ajomatkan päässä kaupungista, ja se sijaitsee erinomaisella paikalla jokaiselle, joka haluaa vain paeta Sisilian maaseudulle. 5 kahden hengen makuuhuonetta, 3 kylpyhuonetta (sis. Kylpyhuone), avokeittiö ja oleskelutila tarjoavat runsaasti tilaa rentoutumiseen ja rentoutumiseen. Tilava ulkoterassi (mukaan lukien erillinen keittokomero) ja erillinen uima-allasalue ulkosuihkulla, luovat täydellisen mahdollisuuden nauttia Sisilian auringonpaisteesta, olisiko se jäähtyä uima-altaassa tai syödä upea maisema, jota ympäröi upea maisema . Se sijaitsee omilla perusteillaan runsaasti oliivi-, hedelmä- ja mantelipuita, joita paikallinen maanviljelijä ylläpitää. Sähkökäyttöiset portit ja hälytysjärjestelmä tarjoavat täydellisen mielenrauhan, kun Villa poistuu pitkään. Etäohjattavat valot asemalla, terassilla ja uima-altaalla auttavat luomaan ympäröivän ja rauhallisen ympäristön, joka sopii erinomaisesti illalliseen ruokailuun. 1. Ciminnan paikallinen pyhäkkö on Santo Vito ja hänet haudataan San Giovanniin paikalliselle kirkolle. 2. Ciminna oli myös elokuvasarja 1963 arvostetusta Luchino Visconti -elokuvasta Il Gattopardo (The Leopard). 3. Kuuluisa Hollywood-elokuvaohjaaja Martin Scorsesen äiti on Ciminnalta ja hänellä on edelleen talonsa kaupungissa. 4. Ciminna on vain 41 km: n päässä Corleonen kaupungista, jonka teki tunnetuksi Francis Ford Coppollan "The Godfather" -trilogia. 5. Massion teatteria (Teatro Massimo) Palermossa käytettiin myös tunnetusti Francis Ford Coppollan "The Godfather Part III". The villa is absolutely lovely, we knew as soon as we arrived we were going to thoroughly enjoy our stay. On our arrival we were met by the lovely Rosetta and her family who showed us around the villa and swimming pool, this was a extremely helpful and reassuring. The villa is very spacious and comfortable, we loved it as soon as we walked in. The views across the valley are truly stunning, so pretty and peaceful. It was difficult to drag ourselves away from the pool but when did we visited The Valley of the Temples, Cefalu, The Capuchin Catacombs and Palermo, all were amazing but we couldn’t wait to get back to the villa. I would definitely recommend staying here and we will be returning in the not to distant future. Thanks to Fabio for answering all of my questions and queries so quickly. We had a lovely relaxed holiday in Ciminna. Our two young boys loved the pool and exploring the grounds around the villa. The villa itself was very comfortable, cool in the evenings and had everything we wanted. We were well looked after by Rosetta & family who checked on us most days. The Villa is 1 mile from Ciminna which is a lovely small town. We were able to get everything we needed in the shops and the playground was a huge bonus for our boys. San Vitos restaurant was great for both dining in and take away pizza. Car hire is essential here. All in all a great holiday. 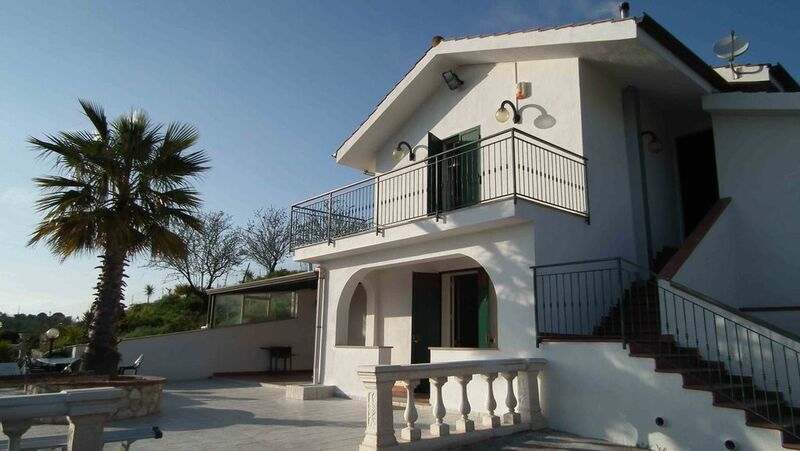 Beautiful villa in perfect location to explore Sicily . The Villa has everything you need for a home from home holiday . Great views , great pool. Highly recommend. My husband and I stayed at this villa for 8 days/7 nights end of May/early June of 2016. Dario was awesome to work with in the booking process & we chatted over email and via phone, he was extremely kind and helpful, never hesitated to answer any of our questions. Once we arrived, Giuseppe the caretaker of the house, assisted us with anything we needed & checked in on us from time to time. We were already familiar with the area because my husband was born there and still has family there. The villa is beautiful, with 5 large bedrooms and 3 large bathrooms, a large kitchen (large refrigerator) and living room and the outside is just breathtaking with the pool and terrace area. There’s even an outdoor kitchen area! We didn’t need to use all the bedrooms but we had room to separate our clothing and luggage. The villa has all you need, dishes, utensils, pots and pans, linens, pillows, towels, etc. – pretty much everything you can think of. We did go to a supermarket (Conad) in the next town to pick up a few items for the week and we replaced anything we used: paper dishes, paper towel, plastic cups, napkins and toilet paper. The villa stands alone and the other neighboring homes are a good distance away and you don’t hear any street/car noise. We had plenty of privacy when we sat outside at the pool or on the terrace and the villa has a gated/security entry which only you (and Giuseppe) have access to when you stay there. We felt extremely safe and secure with the gated entry and I had no concerns staying at the villa alone one evening while my husband went into town. The views from the pool area and the upstairs bedroom with the balcony are amazing – views of olive orchards and the hillside of Ciminna. We highly recommend this villa. We had a wonderful stay at Villa San Filippello and hope to return one day! The villa had everything we needed, including towels and linen (some villas we enquired about previously didn't include this or charged for rental). We didn't need to use all the bedrooms, but there was plenty of space to put our belongings and luggage. The villa is set well away from the road and so noise from traffic etc was at a minimum and the view of the surrounding hills and Ciminna was wonderful. The pool was lovely to swim in (even in October) and perfect to lounge around! It takes less than 5 minutes to drive into Ciminna itself from the villa, and although a small town it has all the essentials. The ladies at Blu Market speak english and were very helpful in arranging a meal for us at San Vito. And we highly recommend Habama Cafe (food to die for) and Gattopardo Bar with excellent pizzas to eat in or take away. Really recommend it for those who want to get away and experience Sicily away from the tourists. Excellent villa and excellent town, a real gem! I booked this villa through this website, which was simple. The communication and map provided made it extremely easy to organise and to find. The villa itself is lovely, well laid out and well proportioned, the outside area and pool was excellent and is exactly what is needed for summer in Sicily. Fabio was excellent throuh the booking process and Giuseppe met us at the villa. Giuseppe explained to us all the details of the villa and the town of Ciminna, he also booked us a table at San Vito's for that evening. We also bumped into him a number of times during the week and he was always friendly and helpful. Ciminna is a beautiful and quaint little town, with everything that is required; supermarkets (thank you ladies from the blue market! ), bars and truly great restaurants. It is an easy drive from the airport and this pretty close to the coast. All in all, a wonderful experience and we cannot wait to return! Ciminnan kaupunki tarjoaa jotain muuta kuin tavallinen loma. Se sijaitsee 600 m merenpinnan yläpuolella Madonie-vuoristossa vain 38 km: n päässä Palermosta ja 22 km: n päässä Trabiasta (lähin ranta). Se on myös helpon matkan päässä tällaisista historiallisista kaupungeista kuten Monreale, Agrigento ja Cefalù. Kuten monet Sisilian pienet kaupungit, Ciminna on täynnä runsaasti historiaa ja luonnetta. Voit syödä ulkona lukuisia ravintoloita, pizzerioita ja kahviloita kaupungissa, tai voit vain istua ja rentoutua baarien ulkopuolella ja nauttia paikallisesta sisilialaisesta elämästä, jossa on tarjolla hienointa espressokahvia. Sisilialaiset haluavat viettää aikaa syömisen ja nauttia paikallisten tuotteiden laadusta joka aterialla, joka löytyy paikallisista supermarketeista. Tuoreita paikallisia tuotteita on aina tarjolla, joka sisältää maukkaimmat hedelmät, kinkut ja lihat, juustot ja oliivit. Paikalliset ovat erittäin ystävällisiä, ja suurin osa baareista pysyy auki, kunnes viimeinen asiakas lähtee. Although the rates are based upon Saturday to Saturday bookings, there is no surcharge for mid-week to mid-week bookings, so that our guests can take advantage of the low cost flights on offer from Ryanair and Easyjet. Add-on days at pro-rata rates are dependent upon availability, please contact me if more information is required. Arrival time from 13.00 pm and departure no later than 10.00 am.